Ameris Bank, which began as American Banking Company in October of 1971, is focused on creating a distinctly different way of helping customers manage and make the most of their money. Ameris Bancorp is the parent company of Ameris Bank, and is headquartered in Moultrie, Georgia. 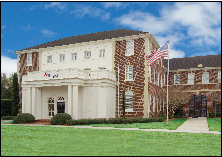 With banking locations in Georgia, Alabama, Florida and South Carolina, Ameris Bank offers the convenience and expertise of a large bank, with the personal attention that can only be found at a community bank. Ameris Bank Mortgage Services is a southeastern wholesale residential mortgage lender, proudly serving mortgage brokers and lenders with residential financing needs.